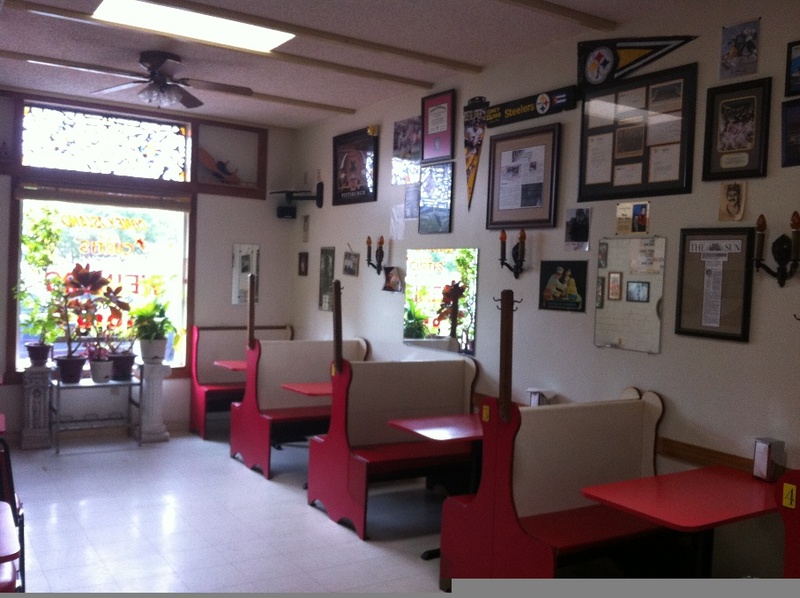 Mile 1 – Coney Island/Curtis’ Famous Wieners, Cumberland, Md. Curtis’/Coney Island on North Liberty Street in Cumberland has been open since 1918. If you are able to dine at only one place in Cumberland, Curtis’/Coney Island Famous Wieners has to be on your short list. It’s pretty much the best hot dog joint ever (says a Western Marylander). But seriously, Curtis’/Coney Island is steeped in Cumberland history, and has been around long enough to span at least four generations. If you meet a Cumberland native (like me), chances are their parents and grandparents have had hot dogs in the exact same booths – but decades earlier. Just a note – Curtis’ and Coney Island are the same place now, but were separate establishments until about 13 years ago – more on that farther down. I’ve rarely heard anyone ever refer to the place as “Curtis’,” instead referring to it by the “Coney Island” name, so that’s the name I’ll be using. Memorabilia on the walls of Curtis’. Coney Island has been around since 1918, and as far as I know, the recipe for “Coney Island sauce” hasn’t changed since it was created. The restaurant has always been a family affair, too. 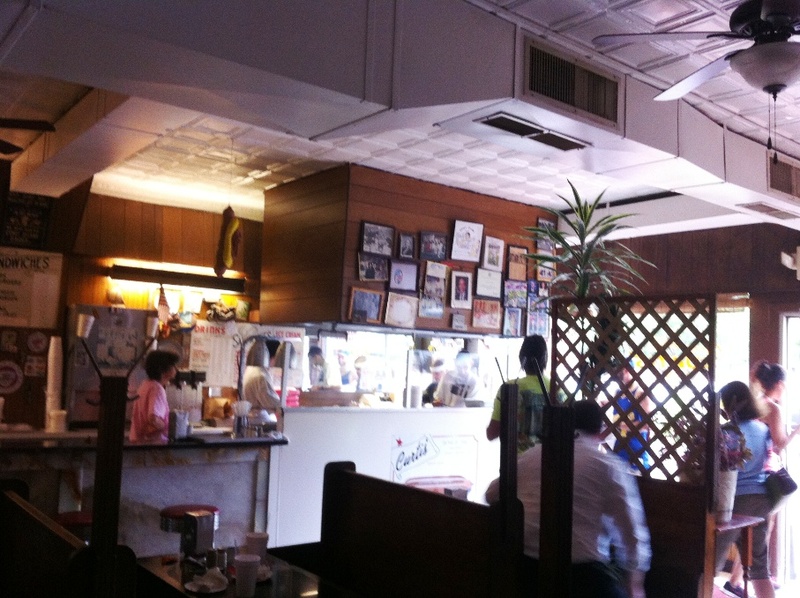 Currently, Gino Giatras is the proprietor, taking the place over from his father, Louis “Louie” Giatras (Louie died in 2007). Locals tend to refer to members of the Giatras family by their first names, regardless of whether or not they actually know the family personally. Coney Island can be traced to business ventures by Greek immigrants around the beginning of the 20th Century. Louie’s obituary in the Baltimore Sun states that the first hot dog was sold around 1905, and the product took off. 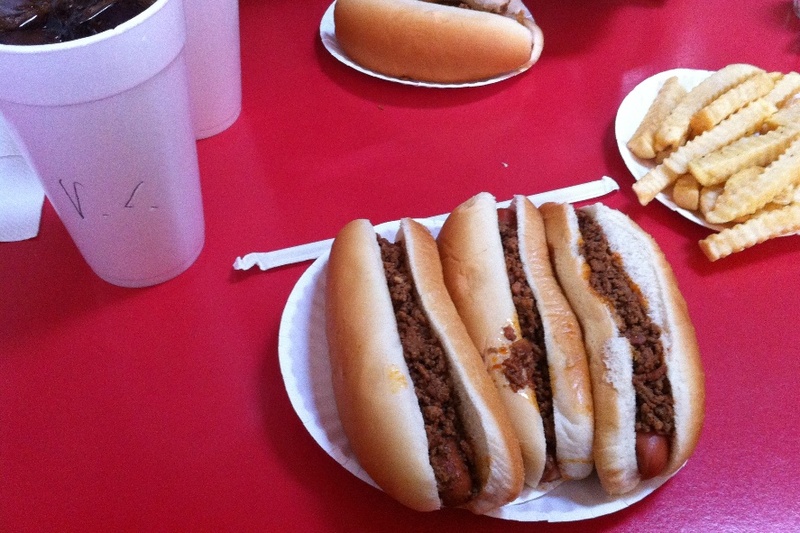 Because of the food’s success, the family started two hot dog joints – Coney Island and Curtis’. 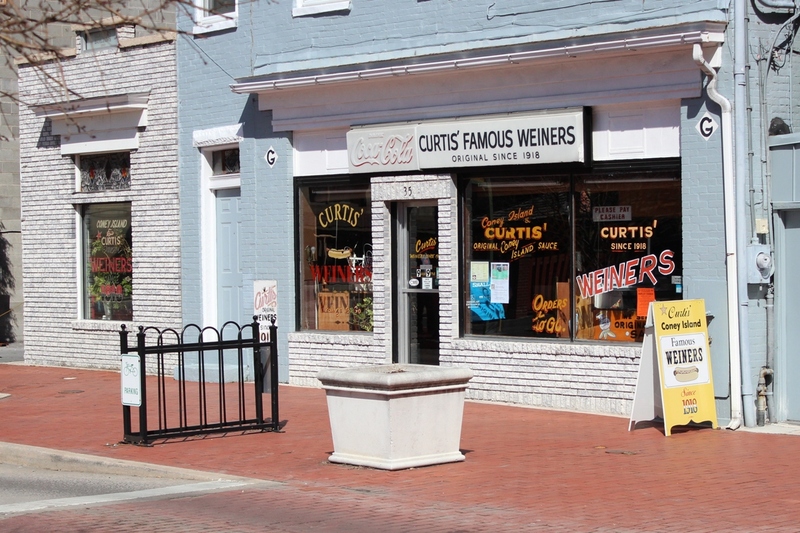 Curtis’s was located at 35 N. Liberty St., and Coney Island was farther up Liberty Street toward Baltimore Avenue. Both restaurants were essentially the same menu-wise, and both had kitchens in the front of the restaurant, but each had different decor. The old red booths moved from the original Coney Island location when it was merged with Curtis’. In 2000, the restaurants combined, with Coney Island moving into an expanded Curtis’. Today, the side where Curtis’ looks pretty much the same as it always has. On the other side of the restaurant, the iconic red booths that were part of Coney Island were moved into the new dining area when the hot dog joints merged. 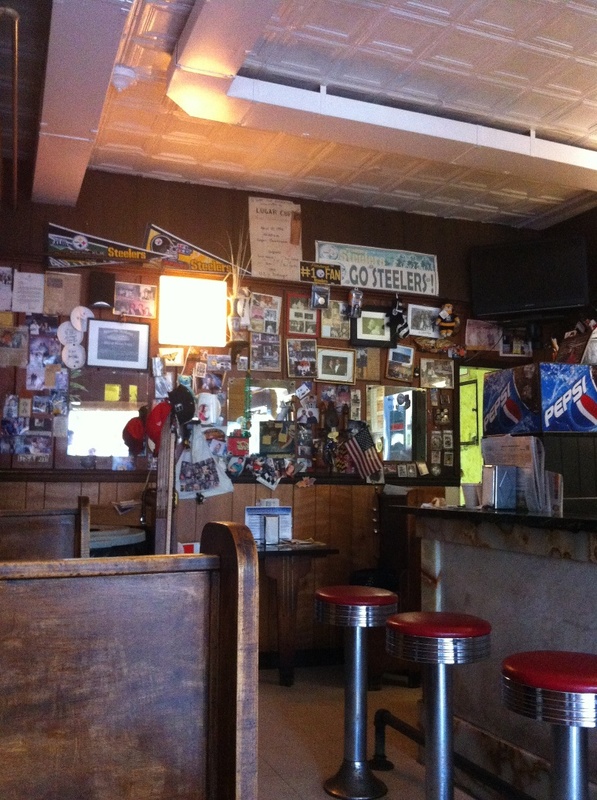 The restaurant’s walls are covered in memorabilia, most notably historic newspaper articles, Pittsburgh Steelers decorations and photos. Gino is usually working, yelling orders in the small kitchen at the front of the restaurant. My usual go-to: hot dogs with sauce, fries and a vanilla Coke. Coney Island/Curtis’ is particularly famous for its sauce that goes on hot dogs. The base is hamburger, which is combined with several seasonings to produce a sauce that is drier than toppings at other hot dog establishments, but still fairly moist. Of course, there are all the regular toppings as well. 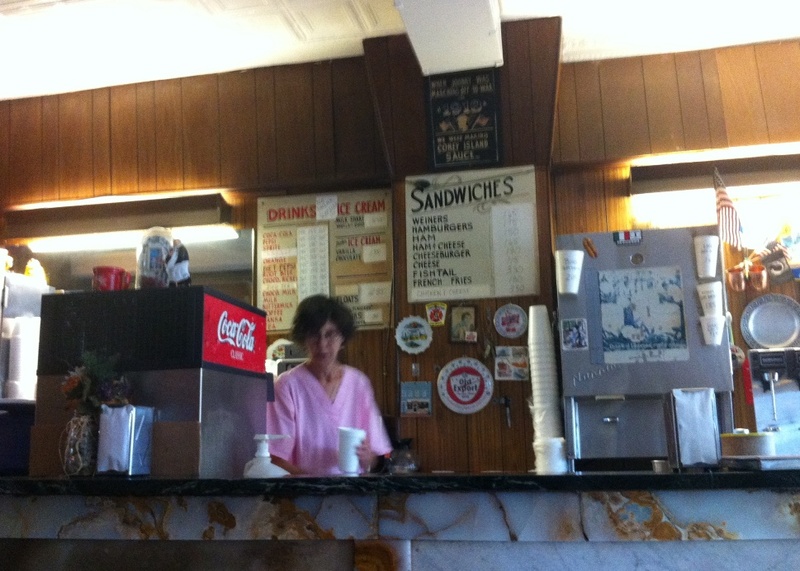 Curtis’ also makes vanilla Coke/Pepsi the old fashioned way – by actually adding syrup to the soda. I believe they make cherry Coke the same way, too. They also make a few other old-fashioned drinks as well (none with alcohol). A view toward the front of Curtis’. You can order at the window for take out, or seat yourself at the booths or at the bar to be waited on. The wait staff generally tends to assume that you’re a local and know what you want, so be sure to take a look at one of the menus on the wall as you’re finding a seat (this has thrown off some of my friends from out-of-state). Chances are you’ll be ordering a hot dog anyway, but still. Hot dogs are ordered by amount and topping. So, for my usual three hot dogs with sauce (I tend to indulge when I’m home), I order “three with sauce.” I’ll usually have an order of fries brought to share with the table as well (they’re the crinkle-cut kind). Your food will typically come out within just a few minutes – probably a lot quicker than most fast-food places. If you’re dining in, your bill will be given to you with your food, but don’t feel rushed. Pay at the front when you’re ready to go. Coney Island is open Monday through Saturday from 9 a.m. to 9 p.m. It is closed on Sunday. Parking is available on North Liberty Street and throughout downtown Cumberland. After lunch or dinner (or breakfast?) at Coney Island, visit the relatively large variety of shops in downtown. If you’re heading farther west along the National Road, check out other great hot dogs at Fiddle’s Confectionery in Brownsville, Pa., or Shorty’s Lunch in Washington, Pa.! Mile 362 – Madonna of the Trail (Ind.) – Richmond, Ind. The Madonna of the Trail in Indiana. 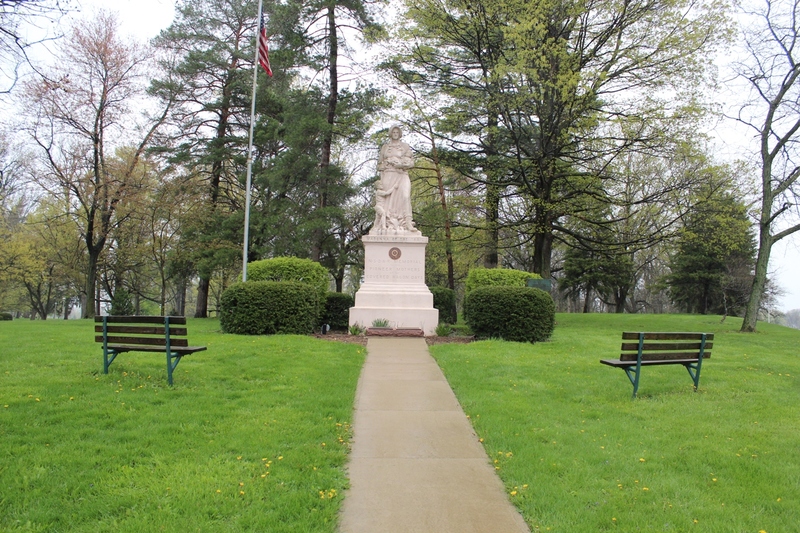 The Madonna of the Trail monument in Indiana is perched on a small hill overlooking the National Road in Richmond, in the southwestern corner of Glen Miller Park. This monument is maintained by the Indiana Daughters of the American Revolution, which maintains a brief webpage about the monument here. Indiana’s Madonna has never been moved, and underwent cleaning and rededication in 1988, 1998 and 2005, with the latest restoration being the most extensive. To get to the monument from the westbound lanes of U.S. 40, make a right turn immediately before U.S. 40’s intersection with 22nd Street. Eastbound traffic should turn onto 22nd Street before making a right turn into the park. The monument will be visible on the right. Pullouts for parking are available along the driveway into the park. Informational signs are adjacent to the monument. 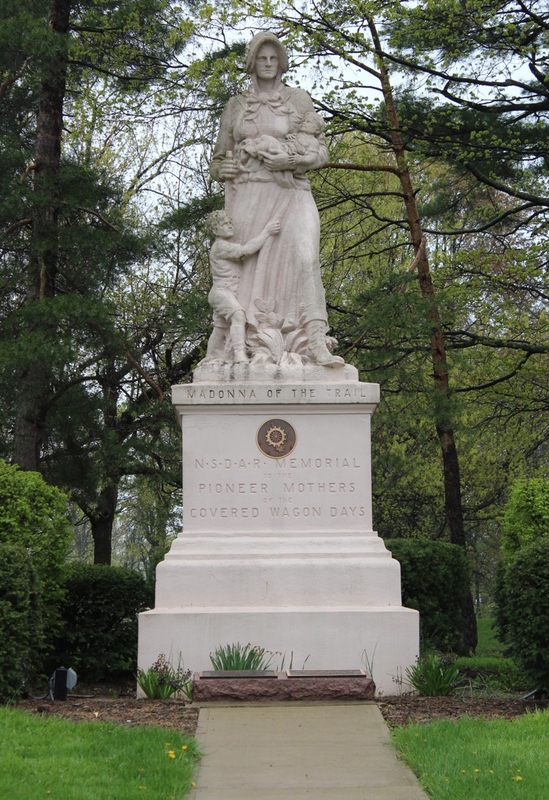 The Madonna in Indiana was the ninth monument to be erected. On the National Road, other monuments are in Beallsville, Pa.; Wheeling, W.Va.; Springfield, Ohio; and Vandalia, Ill.
Non-National Road monuments are in Bethesda, Md. ; Lexington, Mo. ; Council Grove, Kan.; Lamar, Colo.; Albuquerque, N.M.; Springerville, Ariz.; and Upland, Calif.
Mile 398 – Frosty Boy, Knightstown, Ind.